If you're in Port Blair, Andamans, this is one adventure you can't miss! 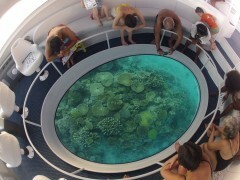 This unique glass-bottom boat lets you discover the vivid underwater world just below the surface of the blue ocean. This is a 30 minute speedboat ride that whisks you away on a smooth ride to the further coral reefs, so you'll get the best views. You'll attend a safety briefing session and watch a video, and then it's time to set off. You'll get comfortable seats and can enjoy the ride and the beautiful views, until you get to the coral reefs. Here, the boat stops, hovering in the water while you peer down through the glass floor of the boat to get a closer look. 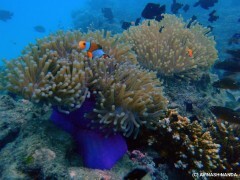 You'll see fish, coral, seaweed, and exotic marine creatures. This glass-bottom boat ride is ideal for those who don't have the time to do scuba diving or snorkelling, or those who don't want to get wet. It's an ideal adventure for families with young children or senior citizens. This adventure starts conveniently from Port Blair, so you don't have to go all the way across to the islands to enjoy the marine world of the Andamans. Just a short speedboat ride away from the mainland, there are vast coral reefs that are teeming with life. Depending on the weather, you'll be heading towards Snake Island, Viper Island, North Bay Island, or Ross Island. En route, if you're lucky, you might see dolphins leaping in the water alongside the boat. And if you're really lucky, you might even see a curious turtle swimming up to investigate the glass bottom of your boat! • Get a close-up look at the underwater world without going into the water. 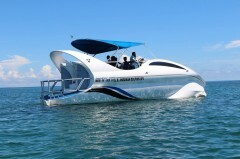 • Enjoy a speedboat cruise in the blue seas. Explore Port Blair from a different angle. Consumption of alcohol or smoking is not allowed while on cruise. 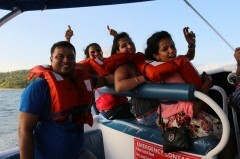 You must pay attention to the safety demonstration and follow the instructions of the boat staff during this Andamans adventure ride. If the weather is bad/visibility is low, the boat will not depart from the shore. In this case, you will get a full refund. 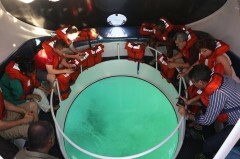 For cancellations of the glass-bottom boat made 0-7 days before start of the trip: No refund. For cancellations of the glass-bottom boat made 8 days or more before start of the trip: 90% of the trip cost will be refunded, minus any transaction charges. Do make sure you arrive at least 1 hr before departure time so that you can attend the safety video session and fill in any paperwork. Daily departure timings are: 08:30 to 09:30 hrs; 10:00 to 11:00 hrs; 11:30 to 12:30 hrs; 13:00 to 14:00 hrs; and 14:30 to 15:30 hrs. Do plan your day so that you arrive at the Rajiv Gandhi Watersports Complex one hour prior to your departure time. You'll start with a demo video so you can learn about the safety procedures to be followed on the boat. After that, you'll board the speedboat and head out to the open seas. The boat stops 2-3 times during this half hour session and you'll have plenty of time to enjoy the sights. During your journey you'll also be given beverages and snacks. At the end of the trip, the boat returns to the jetty. Trip ends here. All flights to the Andaman Islands land at Port Blair airport. From here, or from anywhere else in the city, you can get to the Rajiv Gandhi Watersports Complex via local transport.